I do not have aquaphobia. I do, however, have a lovely new pair of socks. 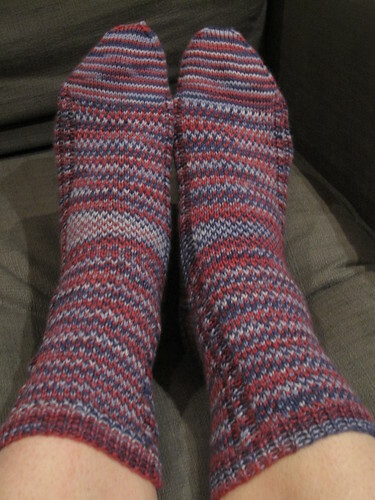 And since my sock output so far in 2011 has been all for other people, these are mine! All mine! Yarn: Hill Country Yarns Sweet Feet in "Blueberry Wine", 400 yds/100 gr. Gauge: 10 sts/11 rows per inch in stitch pattern, 8 sts/12 rows per inch in stockinette. Comments/mods: This is a terrific pattern for breaking up variegated or handdyed yarns with lots of contrast. The slipped stitch pattern lets you break up any pooling (except around the gussets there on the foot), and makes a really nice cozy, thick, cushy fabric. The designer included a two-stitch cable on either side of the instep to give a bit of extra stretch. This was a great feature, and the pattern, while written for a women's medium, easily fit around my US 10s. I might have had to make them a bit longer, but that wasn't a big deal. 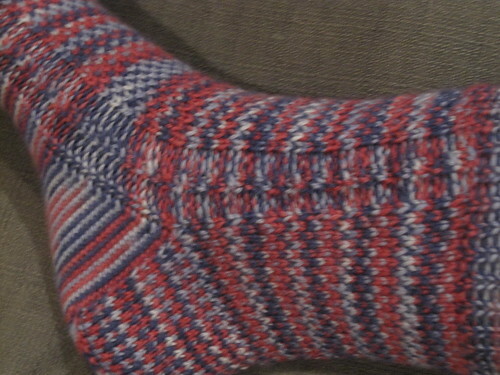 Fast knit, great breaking up of colors, new socks. What's not to love? Written by porpoise On March 24, 2011 In "11in2011", "socks"